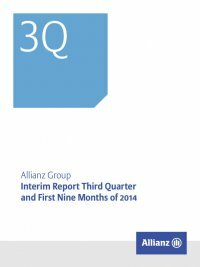 Interim Report Third Quarter and First Nine Months of 2014 Allianz Group66 Reportable segments – Property-Casualty Reportable segments – Property-Casualty € mn German Speaking Countries Western & Southern Europe Iberia & Latin America three months ended 30 September 2014 2013 2014 2013 2014 2013 Gross premiums written 2,447 2,361 2,406 2,360 1,086 1,023 Ceded premiums written (409) (410) (167) (160) (153) (165) Change in unearned premiums 538 520 251 314 22 88 Premiums earned (net) 2,576 2,470 2,490 2,514 955 946 Interest and similar income 270 276 215 220 46 46 Operating income from financial assets and liabilities carried at fair value through income (net) 10 (23) (6) – 1 1 Operating realized gains/losses (net) 74 14 – – – – Fee and commission income 36 50 9 6 – – Other income 5 6 1 2 – – Operating revenues 2,972 2,794 2,709 2,742 1,003 993 Claims and insurance benefits incurred (net) (1,690) (1,876) (1,505) (1,522) (708) (653) Change in reserves for insurance and investment contracts (net) (152) (95) (8) (11) (2) (1) Interest expenses (2) (3) (6) (2) (1) (1) Operating impairments of investments (net) (4) (2) – – – – Investment expenses (31) (30) (26) (24) (5) (3) Acquisition and administrative expenses (net) (648) (648) (674) (668) (250) (242) Fee and commission expenses (33) (47) (8) (9) – – Restructuring charges (2) (3) – – – – Other expenses (6) (5) (1) (1) – – Operating expenses (2,569) (2,708) (2,229) (2,239) (966) (900) Operating profit (loss) 404 86 480 503 37 93 Non-operating income from financial assets and liabilities carried at fair value through income (net) (13) (4) 1 2 2 1 Non-operating realized gains/losses (net) 67 34 37 34 8 (2) Non-operating impairments of investments (net) (7) (6) (21) (117) (2) – Amortization of intangible assets (1) (1) (11) (12) – – Non-operating items 47 23 6 (93) 8 (1) Income (loss) before income taxes 450 109 486 410 45 92 Income taxes (109) (30) (176) (149) (8) (32) Net income (loss) 341 79 310 261 37 60 Net income (loss) attributable to: Non-controlling interests – (2) 4 6 1 2 Shareholders 341 81 306 255 36 59 Loss ratio2 in % 65.6 75.9 60.5 60.6 74.1 69.0 Expense ratio3 in % 25.1 26.2 27.1 26.6 26.1 25.6 Combined ratio4 in % 90.7 102.2 87.5 87.1 100.3 94.6 1 The 2014 analysis of the ­Allianz Group’s asbestos risks resulted in a reduction of reserves and a positive run-off result of € 86 MN reflected in the operating profit for 2014. 2 Represents claims and insurance benefits incurred (net) divided by premiums earned (net). 3 Represents acquisition and administrative expenses (net) divided by premiums earned (net). 4 Represents the total of acquisition and administrative expenses (net) and claims and insurance benefits incurred (net) divided by premiums earned (net). 5 Presentation not meaningful.